Hi, I’m Karli, a Registered Nurse, Midwife and also Calmbirth® Educator. Calmbirth® is an incredibly powerful tool for women and their partners during pregnancy and childbirth, which can also be carried into parenting and life in general. Calmbirth®’s motto is that “With Knowledge Comes Confidence”, a statement that I truly stand by. I enjoy educating and empowering couples to be informed about their options and the normal process of birth. When women know what to expect and what is normal during childbirth they have the ability to create a positive birthing experience. Additionally, when partners and support people are also informed they can better facilitate and support women to have the best birth experience for them. In addition to my passion for being a Calmbirth® educator I have eight years combined experience as a Paediatric Nurse and Midwife. 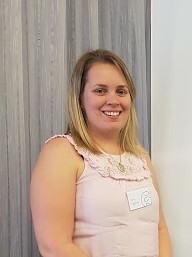 I live and breathe childbirth, currently working as a Midwife at Sunshine Coast University Hospital, where continually I find myself employing Calmbirth® techniques to help patients during childbirth. My love and passion for this program began when I completed the Calmbirth® program to prepare for the birth of my beautiful daughter Lucy, who is now 2 years old. It was during this time I also enlisted the services of Coastlife Midwifery, so I can also personally vouch for their outstanding services. When I look back at it, I do not describe the birth as painful but as intense. It was the most intense yet rewarding and empowering feeling I have ever experienced in my life. I am forever grateful for the fantastic tools and knowledge myself and my partner received from the course, which gave us the ability to work together for the labour and birth of our daughter. It is this incredibly empowering feeling I want to pass onto other couple through being a Calmbirth® educator. I am so excited to be offering classes to couples on the Sunshine Coast at Coast Life Midwifery beginning in 2018. Please contact myself directly via email or phone or through Coastlife to book in for a class.